With Florida’s unpredictable climate and sometimes treacherous weather, citrus-growers are constantly looking for better, more efficient ways to harvest crops. Jackie Burns often comes to their rescue. 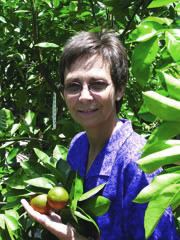 Burns, an IFAS professor of horticulture, tries to make mechanical citrus harvesting more efficient by studying harvest and post-harvest physiology. Specifically, Burns develops and studies the use of abscission agents -or compounds that help loosen mature fruit from trees. “Spraying trees with an abscission agent a few days before harvest loosens mature fruit and makes harvesting faster and easier,” Burns says. Burns and her research team are currently working on three promising abscission agents that must meet the requirements of being non-toxic, selective, cost-effective and environmentally safe. The selectivity of the abscission agent is especially important on trees that have young, developing fruit and mature fruit at the same time. Abscission agents will also allow machines to harvest faster because mature fruit will be loose, and consequently less machine time is needed for each tree.